The area around Lake Como, or private://Lago di Comoprivate:// in Italian, is pretty characteristic. It has a kind of flair and sense of history that tends to impress its visitors in a sense deeper than only from a touristic point of view. It has been appreciated for its beauty and uniqueness for ages, and even as early as the Roman Times. Its atmosphere and natural surroundings have been the inspiration for an important part of the creation of Naboo, in the Star Wars movies. • Como - At the southern end of the lake, the lake's main town is a good base and although not as attractive as some of the other towns, it remains an elegant resort. The town has a population of roughly 80,000 people and has Roman or pre Roman origins. • Tremezzo - Beautiful little town, right across from Bellagio. Main attraction is Villa Carlotta with its splendid botanical garden and nice waterfront. 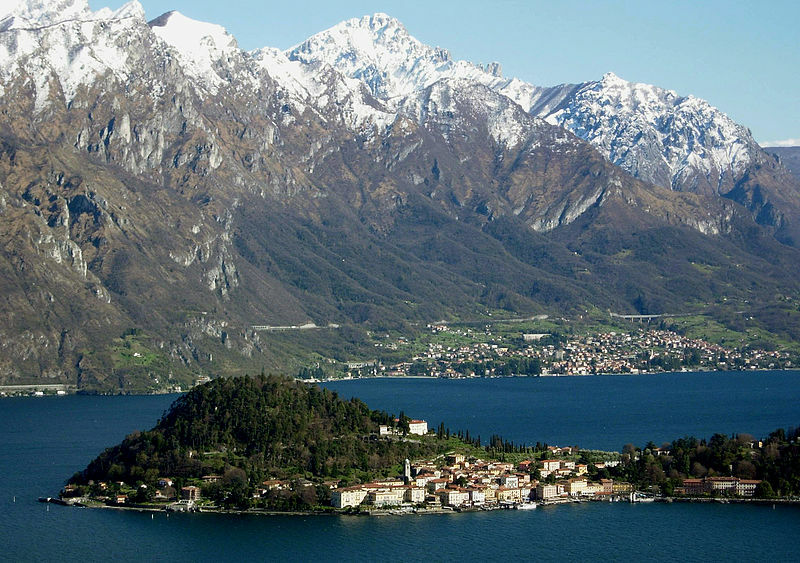 • Griante - Small village situated on a plateau on the West side of Lake Como. 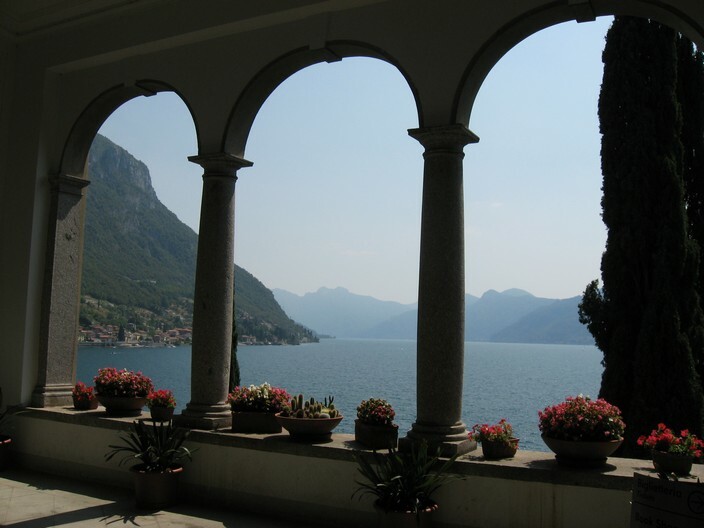 Worth visiting for its surrounding villas and for the spectacular views of Lake Como from the Santuario Della Madonna delle Grazie di San Martino, a small church perched high on the mountain side. • Menaggio - The main town on the Western Shore, it's an attractive town and not as touristy as Bellagio and Varenna opposite. Has a nice pedestrian only area with coffee shops, gelaterias and restaurants. Also has a lake-front mini golf with a snack bar. • Bellagio - Very attractive town at the junction of the two 'legs' of the lake. Can be expensive. This is the busiest of the tourist oriented towns. Bellagio is a hub for the boat service on the lake. • Varenna - Another attractive town on the Eastern shore opposite Menaggio and Bellagio. Worth visiting for the attractive and relaxing gardens of Villa Cipressi and Villa Monastero. Varenna also has the remains of a castle where a falconer gives shows occasionally. The castle is a steep hike, with a rise of many hundreds of vertical feet. • Bellano - Nice non-touristed town, with a pedestrian only area in the town center. In the Italian tradition, most stores are closed from noon/1:00PM until about 3:00PM. Bellano was a silk production center but those factories are now closed. The orrido (gorge) is geologically impressive but most of the tremendous flow is now directed into a powerhouse. The main access to the lake is from Milan and Bergamo. It is also possible to cross the border from Lugano (Switzerland), and arriving at the lake at Menaggio. In the North, the lake can be accessed through the Splügen pass (closed from end of autumn to the beginning of spring), or from St. Moritz, both entering from Switzerland. Regular trains run from Milan to Como (beware it has 3 stations: Como San Giovanni, Como Nord Lago and Como Nord Borghi). Trains also run from Milan and Bergamo up the Eastern Shore from Lecco to Varenna and Colico and then on to Sondrio and St. Moritz. Station Como San Giovanni is a little bit outside the downtown, but there are a number of buses that stop there, and one can buy tickets at the Tabac in the station for a few Euros, or walk to the center of town. Overnight sleeper trains run from Amsterdam via Duesseldorf, Cologne, Frankfurt and Basel stopping at Como San Giovanni on their way to Milan. Similar daytime trains also run.